As the world consumerist class continues to grow, the global annual meat production is expected to increase up to 376million tonnes by 2030 [World Health Organization].With this rising demand, the newly-improved food safety standards in the UK has affected the meat processing industry. The UK Food Standards Agency’s new sustainable regulatory model focuses on transparency regarding food safety. So, there could beequipmentused for automated operations to meet such standards. That way, meat processing facilities can keep up with the demandwhileensuring a high-quality meat production. 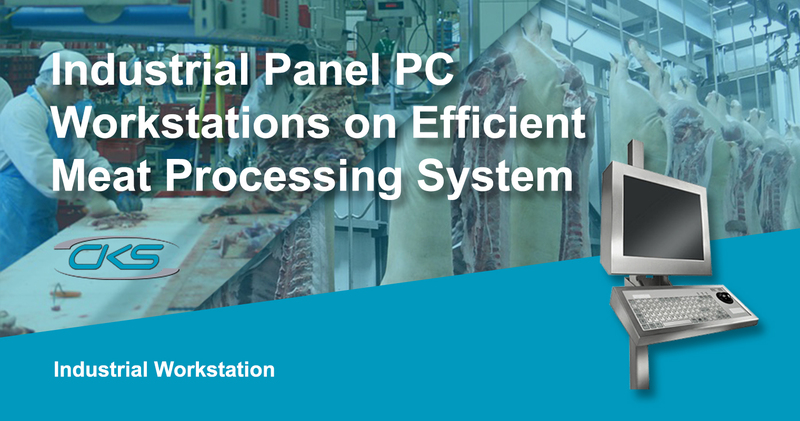 Utilisingindustrialworkstationfor panel PC is an ideal solution for meat processing plants to produce first-rate products at an efficient speed. Its quality and ergonomic designprovidean efficient way for the meat processors to improve its production and streamlinetheoverallsystem. So, how can industrial computer workstations be utilised to augment meat processing operations? Keep reading this blog to understand how it can help to increase production rate and ROI. Havingequipmentthat works well withautomatedoperationswhilepromoting operational efficiency is critical in meat processing operations. With a systematic approach, processing time canbe reduced,andat the same time, bottlenecksare eliminatedas well. Now, building an industrial workstation can bea greatoption for meat processing facilities. Its designis madefor work environments that have stringent sanitation compliance. Plus, panel PCs and other peripherals canbe conveniently installedto these workstations. So, it provides an ease of use for the meat processors to work and operate required functions without the hassle oftheclutteredworkspace or tangled cables. So, in the next sections, learn moreaboutwhy this industrial-grade workstation is suitable for meat processing operations. Why should meat processing facilities have panel PCs installed on rugged workstations?Computersmounted on this pedestal createsan organisedenvironment, promotingdynamicand systematic operations. Every industrial facility imposes a harsh work environment. For meat processing plants, harsh conditions include moisture and dirt intrusion and extreme temperatures. However,computers mounted on rugged workstations are safe from overheating, liquid and dirt damages. Plus, cablesarecorrectly organisedwhich prevents any accidents. So, meat processing facilities have safer work environment and equipment are protected from harmful conditions. With more stringent food safety standards, computing systems mounted on stainless steel workstations is an ideal solution. It can be set up in areas withmachinerydirectly involved in themeat cutting process. Meat processors can continue to upgrade theirautomatedoperationswhilemaintaining a sanitary environment. Ruggedisedworkstations bring computing systems at the core of the supply chain. Embedded PCs and peripherals on workstations provide convenience since necessary functionalities canbe installedin one place. Thus, it transforms a work area to a highly-efficient and dynamic space. As a result, it boosts productivity in meat processing operations. Food safety, sanitation and efficiency are the guiding principles in the meat processing industry. Automated technology is utilised to meet these requirements and produce high-quality products. So, to achieve astreamlined,automated process, embedded PCs mounted to rugged workstations is an excellent solution. It promotes a systematic, productive and safe approach to meat processing. Contact anindustrial computer manufacturertounderstand furtherhowindustrialworkstations can be fit to specific automated meat processing operations.